My Review and Teachers’ Tools for Navigation: If you have read A Corner of the Universe, you know what an emotionally-charged author Ann M. Martin can be, and she once again tells a heart-wrenching story with a voice that will not leave your head. 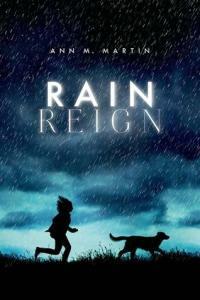 In Rain Reign, Martin tackles Rose’s story. Rose is such a true character. A brilliant young girl with OCD and Asperger’s syndrome who is obsessed by homonyms. She is a girl that is so unique and intriguing. As a teacher, I very much connected with her and how I would nurture her gifts within my classroom; however, I also saw the challenges that Rose faces as well. What makes this book truly stand out is the first person point of view. You, as the reader, are in Rose’s mind and living her life. You experience the neglect of her father, the love of Reign, the obsessiveness, the homonyms, the outbursts, and the support of her uncle. Because I was IN her life, I just couldn’t put down the book. I had to know that Rose and Rain were going to be okay. As a teacher, I want kids to read this book because they will fall in love with Rose and Rain. Through this love, they will build empathy in their hearts because they will just want to know that Rose and Rain will be okay. Ricki’s Review: Check out Ricki’s Review here! Discussion Questions: How do you feel about Rose’s dad? ; Can you think of homonyms that weren’t mentioned in the book? ; Do you think it was right of Rose’s dad to take Rain? ; How would you feel if your dog disappeared? We Flagged: “I’m going to tell you a story. It’s a true story, which makes it a piece of nonfiction.